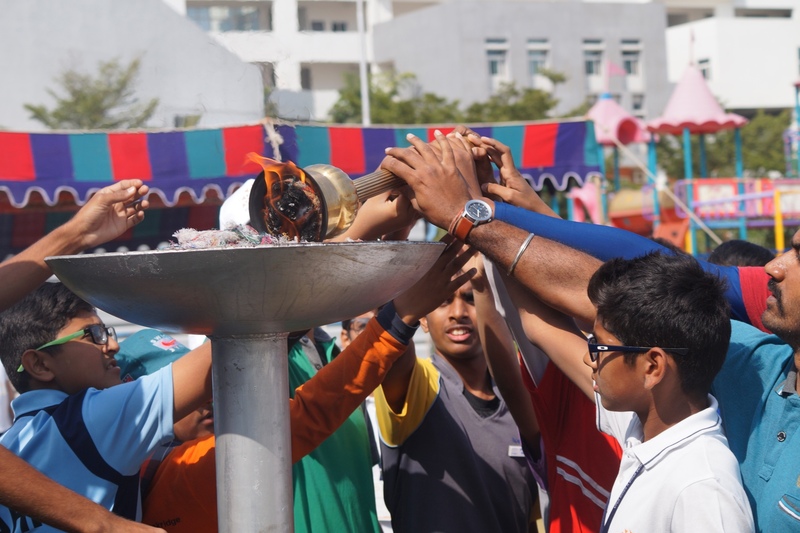 Hyderabad, January 4, 2017: Open Minds – A Birla School inaugurates their second annual Interschool Sports Festival - Muddy Soles, today in the premises of Gachibowli. Over 350 students filled with enthusiasm, displayed their athletic skills in different form of sports - Athletics, Individual and Team sports. The tournament had nine well reputed schools participating in the event with an average of 35 participants from each school. In the 50 Meters run in U-12 Boys category, Varun from CGR School won while Prateek & Vedant both from Meridian School stood at 2nd and 3rd places respectively. In 100 meters run, the U-16 boys Category, Anish Pati from Glendale School won, while Manas from Meridian School & Adyant from Ganges Valley were at 2nd and 3rd places respectively. In the 50 Meters run in U-12 Girls category, Anshika from CGR School Won the first prize while Varshini & Devasree, both from Ganges Valley School won 2nd and 3rd places respectively. In 100 meters run , the U-16 Girls category, Vindhya from Glendale School the Participant stood firstwhile Harika from OBUL Reddy School and Aashna from Open Minds School stood at 2nd and 3rd places respectively.